The theme of this recipe swap was a secret recipe swap. Each blogger was given a fellow blogger to swap with and you were able to choose any recipe you wanted from their blog to make. I selected baked chocolate doughnuts from The Cookaholic Wife. It had been awhile since I had used my doughnut pan and Miss F was off school for spring break. So we had lots of mornings to make breakfast together. She is in charge of pouring, stirring and sprinkling while I handle the rest. These doughnuts are nearly guilt free, using whole wheat flour, applesauce and just one tablespoon of oil. I did need to adapt the chocolate glaze recipe because the chocolate seized up when I added corn syrup to it as called for in her recipe. Preheat the oven to 450 degrees. Grease a non-stick doughnut pan with cooking spray. In a medium sized bowl, stir together the flour, sugar, cocoa powder, baking powder and salt. Add the milk, egg, applesauce, oil and vanilla. Stir until combined well. Fill each doughnut a little over halfway with batter and bake for 7 minutes. Let doughnuts rest in the pan for 2-3 minutes and gently remove them from the pan to a cooling rack. For the chocolate glaze, place the chocolate chips in a microwave safe bowl and melt at 30 second intervals, stirring after each until the chocolate has melted. Stir in the shortening until smooth. 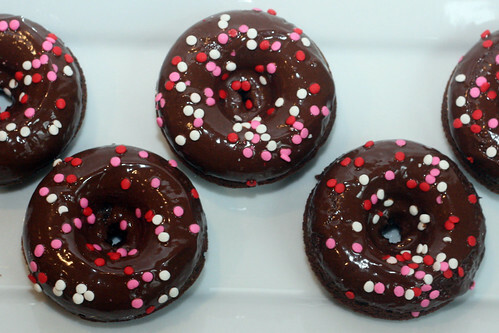 Swirl each doughnut into the chocolate glaze and then top with sprinkles if desired. Glad you liked them! I had the same issue with the corn syrup and thought I did something wrong. I'll have to try it with shortening next time! Glad to hear it wasn't just me. The shortening worked great. Thanks again for the recipe! These look perfect - great photo! And now I need a donut pan. I agree - that photo is making my mouth water. I need to buy a donut pan! and I love that these are made with whole wheat flour.